Genesis Stained Glass is a Manchester-based company designing and making beautiful stained glass. We have over 30 years stained glass design experience. sparkling glass textures or subtle hand painted art work. We design in a traditional or contemporary style. The Glass House specialises in the design and creation of bespoke stained glass windows, kiln formed glass and glass sculptures. Recclesia Stained Glass take on conservation & restoration; commissions & design work; leaded lights & restoration glazing; surveys & reports houses. Traditional Leaded-Light makers who also specialise in glass staining/enameling and Victorian etched glass. Manchester Stained Glass provide bespoke and ready made window panels. They offer traditional and modern designs and methods. Design & manufacture of stained glass products and decorative glass craftware. Artisan design and restore hand painted and fired stained glass windows for ecclesiastic clients, as well as full traditional entrance ways, windows and door panels for domestic customers. The artists and craftsmen use techniques such as sandblasting, etching, brilliant cutting, beveling, and gilding to produce decorative glass, leaded lights, stained glass windows, mirrors and signs. Paul works in all aspects of stained glass and provides from his studio a professional service in glass design, manufacture, restoration and installation. 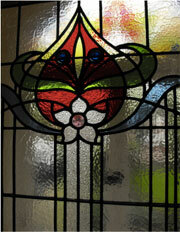 Leaded lights, traditional stained glass, glass etching, carving, sandblasting, gluechip and glass fusing. Leaded window specialists. Glazing repairs and restorations.